The Device: The RollerMouse Pro doesn’t fit cleanly into any pointer device category I know. It’s not a track ball, not a touch pad, not a mouse, not a tablet. It has aspects of all these devices, but is truly its own device. The long cylindrical roller is used to control a pointer. The cylinder spins up and down while sliding back and forth. A traditional left and right mouse button are complemented by a scroll wheel (with the standard functionality) and a centered double-click button. The cylinder can also be pressed down to accomplish a left-click adding further to the convenience of the device. The RollerMouse Pro has two special function buttons (which are absent in the standard RollerMouse.) By default they act as a click-lock (click and hold) and scroll-lock (click and use the main roller to scroll.) A web mode allows the buttons to be used as forward and back in web browsers and the final mode allows custom software to be used to assign the buttons to additional functions. If all that isn’t enough, the RollerMouse Pro is integrated with a wrist rest which improves keyboarding posture. The comfortable, high quality lycra wrist rest is removable for cleaning. In use the RollerMouse Pro is highly functional with a comfort unmatched by any pointing device I have used. I used the RollerMouse Pro daily at work for several weeks prior to this review. For the first few days I found I needed to adjust the mouse tracking speed slower than I typically used with a mouse, but after just a few days of using the RollerMouse Pro I was back up to my typical (“twitchy” as many would say) high mouse speed with all the accuracy I have with a traditional mouse. One of the RollerMouse’s claims is that since the user does not have to reach to their side the hand position is more ergonomic when mousing. While I am not an ergonomics expert I will say that while using the RollerMouse Pro I did find that some tension and aches I had in my right shoulder and lower neck absolutely disappeared. The video below shows how the RollerMouse Pro sits below the keyboard so it can be used with only a minimal departure from the keyboard. To show how little movement is needed I have added stripes to the roller with some orange tape. During this video I moved the pointer all around the screen, from launching a web browser from the start menu, to selecting a link to Gmail, to scrolling around the page, to closing the window. You can see how little movement of the cylinder was required for these standard tasks. While hard to show in a video, if you reach the end of the the RollerMouse’s movement before reaching the corresponding edge of the screen you can feel a click on the cylinder and it will continue the pointer movement to the edge of the screen. This behavior was easier than expected to get used to. I found that using several fingers from my right (dominant) hand gave me the best control, but this second video shows how I was also able to control the RollerMouse Pro with just my thumbs (I used my left thumb to give some resistance on the cylinder while I controlled it with my right thumb.) This method allows the RollerMouse Pro to be used without moving the hands from the keyboard. I found this ideal when working in text-centric applications like word processing and shell sessions. I used the RollerMouse Pro on both Mac OSX and Windows with no need for drivers on either platform. 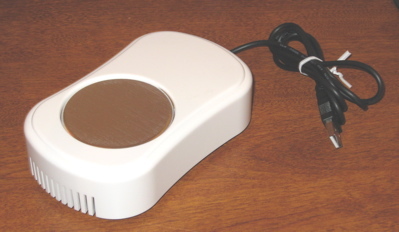 In both cases the RollerMouse Pro was recognized by the operating system as a standard mouse and all standard features were immediately available. While there are advantages to being able to program your own functions to specific buttons it is invaluable that the first two modes mentioned above work without any additional software. I personally didn’t make much use of the two additional buttons between the main array and the roller cylinder. In the long run I might try to program them for copy and paste, but to me they neither make or break the device. Conclusions: After setting up the RollerMouse Pro (which was a breeze) and using it for a few weeks I have found it significantly better than traditional mouses. It offers the advantages of a laptop trackpad (easily accessible with little or no movement from the home position on the keyboard) while offering a fast learning curve and outstanding range and accuracy. While a price of just shy of $200 keeps me from recommending this to the casual user, for those who spend their work days at their computers the RollerMouse Pro has a lot to offer. The unanticipated advantage of the RollerMouse Pro was the liberation of a few square feet of desk space previously occupied by my mouse and mouse pad. An ergonomic design, high quality construction, convenient placement, an integrated wrist rest and unbeatable functionality make the RollerMouse Pro a great choice for anyone who spends hours a day at their computer. It did take several days to get used to, but if you’re not sure if it’s for you there’s always the option of their 30 day free trial. RollerMouse Pro or Classic? There are a handful of differences between the classic and pro versions of the RollerMouse (see the image below, pro on top.) The pro is only $10 more than the classic and features a larger opening for controlling the main cylinder, larger buttons and two additional buttons. All these features make it well worth upgrading to the pro version. White Mountain Gourmet Coffee is a small coffee roaster in New Hampshire and since one of their cafes is local to me in Concord I decided to give them a try. The cafe is well stocked with White Mountain coffee and has a full espresso bar, some food and a fair amount of seating. I picked out a couple coffees I wanted to try and asked the worker at the cafe to suggest a couple more. Service was good and I was ready to try out their coffee with 4 half-pound bags of single-origin coffee. The first of White Mountain’s coffees I tried was their El Salvador Peaberry. This is a pleasant, full bodied coffee with a sweet flavor. Though not overly complex this coffee is very pleasant in the cup and has a nice long finish. The Zimbabwe AA was also rich and flavorful. Somewhat more complex than the El Salvador this coffee has some brighter tones and good depth. Another rich, full-bodied offering, the Sumatra Mandheling had little acidity and a clean finish. White Mountain’s Papua New Guinea is a nice, slightly earthy coffee. This coffee’s slight acidity is pleasantly balanced by a sweet flavor. I specifically sought out rich, full bodied coffees to try, but all of my trials were regular roast. I found the regular roast to make a sufficiently rich coffee, but most of their coffees are offered as a dark roast as well. White Mountain has a long list of single-origin, blended and flavored coffees but my preference, as reflected in my sampling choices is to the single-origin. All the coffees I tried from White Mountain Gourmet Coffee were excellent and I look forward to trying more of their offerings. While I am fortunate enough to be near one of their cafes White Mountain coffee is also available via mail order from their website. I’m a big fan of gadgets so when I saw that Vat19 had a USB device which would act as both a cup warmer and cooler I just had to try it! Vat19 claims the device “Keep a beverage piping hot or cool as ice.” A bold claim for something which powers itself on the small amount of juice the USB bus can put out, but out of the box the device seemed well constructed, so I was optimistic. Unfortunately I noticed the first two flaws with the desktop appliance before I even plugged it in. First, there was no on/off switch anywhere on the unit which, while not tragic, would become a problem if your only free USB port is on the back of your system. Second, the switch to change from warming to cooling is on the back near where the cord exits. While neither of these flaws are tragic, both proved irritating. I plugged the USB Beverage Warmer & Cooler into my free USB on my laptop and heard the fan on the unit spin up. Surprisingly the small fan made quite a bit of noise, considerably more than my Dell laptop, even more than most modern desktops. Ignoring the noise I set the unit to warming mode and put my coffee on the unit. Now another problem… The heating/cooling element was too small for a normal sized coffee mug. A half hour later, with my mug straddling the heating element my coffee had cooled to its typical tepid. For my next cup of the day I switched to a smaller mug which would fit on the heating plate and got somewhat better results. My coffee stayed warmer than usual, but still not warm enough to justify another device and the loss of desk space. Hoping for better results on the cooling side I unplugged the unit and let it cool to room temperature. After lunch I flipped the switch to cool and plugged it in. I was surprised at how quickly the plate cooled so I put my bar-style pint glass full of water on the plate. Half an hour later my water still seemed enjoyably cool, but was it cooler than without? 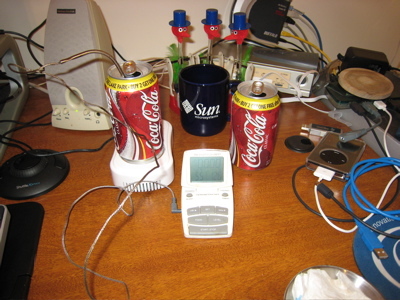 I decided to do a more scientific test of the cooling capabilities of the unit, so I got two cans of Coke out of my fridge and grabbed the trusty cooking thermometer. With one can on the cooler and the other on the desk (far enough away to not be heated by the exhaust from the cooler) I measured the temperature of each over a two hour interval. After the full 2 hours I sipped from each Coke and could tell some difference, but again, not enough to justify another device on the desk. While I love the idea of a USB beverage warmer & cooler the current model from Vat19 falls short of both “piping hot” and “cool as ice”. While the price point of $24.95 is very reasonable the novelty quickly wore off and the many drawbacks doom this gadget to the junk drawer. Perhaps a future rendition will bring improved performance and flexibility, but for now there are better warmers to be had and the cooling effect is not enough to justify this unit. Stan left an excellent comment on my review of the Toddy cold brew system and mentioned the site CoffeeReview.com. They’ve got reviews of hundreds of different coffees and some great reference on coffee. Check it out. Thanks Stan for a great comment!